Experience the best of the Golden Age of Television with this collection of shows from TV’s early years. with 50’s TV Classics: Collector’s Edition you’ll enjoy over 10 hours of comedy, music, variety, game shows and drama starring some of Hollywood’s biggest stars! 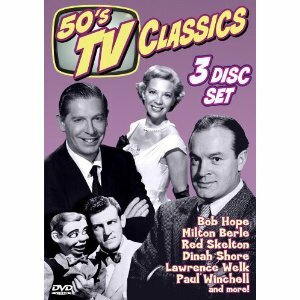 Three discs include episodes of The Bob Hope Show (1957) The Chevy Show with Dinah Shore & Art Carney (1956) The Ed Wynn Show (1950) The Paul Winchell & Jerry Mahoney Show (1950) The Red Skelton Show (guest starring John Carradine), Death Valley Days: Sego Lillies (4/28/53) Death Valley Days: Little Washington (10/1/53) Death Valley Days: Dear Teacher (11/24/53), The Lawrence Welk Show (7/14/56) The Milton Berle Show (5/15/56), Beat the Clock The Celebrity Game Do You Trust Your Wife (Ep. 1) Do You Trust Your Wife (Ep. 2), and Name that Tune. I am delighted to have two copies to give away. Send an email to moviemom@moviemom.com with 50’s television in the subject line and tell me your favorite old-time television show. Don’t forget your address! (US addresses only) I will pick a winner on Oct 8. Good luck! The sensationally talented Anna Kendrick finally gets to play the lead in a story about the cutthroat world of a capella competitions. It’s “Stomp the Yard” with singing, or “Glee Goes to College.” The songs are fabulously entertaining, the romance is sweet, Rebel Wilson’s understated zingers are hilarious, Kendrick is pure joy. John Michael Higgins (“Best in Show”) and co-producer Elizabeth Banks (“The Hunger Games”) are the acid-tongued commentators at the big competitions. And the projectile vomiting is torrential. I blame “Bridesmaids.” I am certain that as this movie was being prepared, some dimwit studio executive saw how well “Bridesmaids” was doing at the box office and ordered up three scenes of disgusting bodily function humor be (awkwardly) inserted. Minutes after the film begins a musical performance is interrupted by massive barfing. We are later treated to two additional and increasingly ludicrous throwing-up tsunamis, plus some cringeworthy jokes, many very crude, uncomfortably racial, or based on increasingly lame plays on the words “a capella.” Few are even remotely funny. Kendrick plays Beca, who arrives at college by herself as everyone else is being dropped off by their parents. She is a loner and she does not want to be there. She just wants to get a job creating music. But her professor father makes her promise to give it a year. If she can complete the year successfully, and that includes an activity, he will let her drop out and pursue her dream. So she joins the girls’ a capella (no musical instruments, just voices) group, led by micro-managing control freak Aubrey (Anna Camp), who is determined to come back from the unpleasant nausea incident at the finals of the previous year that has made them the objects of derision, especially from the champion male group. She insists on keeping everything safe and bland, with uniforms that make them look like 1970’s flight attendants and a set-list of safe but bland middle-of-the-road pop. And there’s a guy. Jesse (Skylar Astin) likes Beca, but Aubrey has made consorting with the members of the male singing group a firing offense. And Beca, very hurt by her parents’ divorce, really does not want to like anyone. But her natural gifts and passion for music inspire her to remix some fresh and edgy songs. The relationships play out through and amid various musical encounters, with the best an informal riff-off competition in an empty swimming pool (good acoustics). Kendrick proves she is a real movie star but the mash-up with low comedy keeps tripping up the movie’s momentum. The musical harmonies are sublime but Beca’s pointlessly hostile Asian roommate, who only speaks to other Asians and a member of the singing group who is unable to make an audible sound are way off-key. Family discussion: Should Beca’s father have pushed her to go to school and try activities? What was the most important thing she learned from being part of the group?